Hi, there is a way to see a report of MAX client connected to each AP? Maybe last 24h or las week? Like top Ap function of nxc2500! 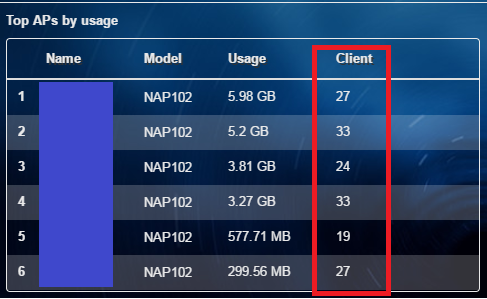 In summary report, you are able to see it in "top APs by usage" wheras it displays the client number. It is the same as the one in NXC. 1. For NAP103 and NAP203, how many maximum user can be connected? 2. If in 1 AP user is full, could get redirect automatically to another AP? or redirect based on best signal capture power? How to setting in NCC? 1. Deployment wise, I would recommend for good quality wifi service (enterprise level point of view), NAP102 about 20 and NAP203 about 25 concurrent clients, depending on how heavy your traffic is going to be should you adjust the numbers accordingly. Specification wise, NAP102 can support to 128 and NAP203 256 clients. 2. You can enable load balancing on NAP if you want to share client loading between the APs, you can find it under AP>configuration>Load balancing page. Generally speaking, redirection will happen when the AP reaches the maxium client number then redirect the ones with longest idle time then signal strength. I have the same question about mechanism of AP redirection. When one AP reaches the maximum clients, the rest of clients will be redirected automatically to another neighbor AP relying on the priority. 1. the longnest idle time AP.